I have had the supplies to make this letter C wreath for over a year! It was finally time to get it done! Besides figuring out how to hang it (a letter C is heavier on one side so it was awkward), it was really quick and easy! First, paint the whole thing one color. 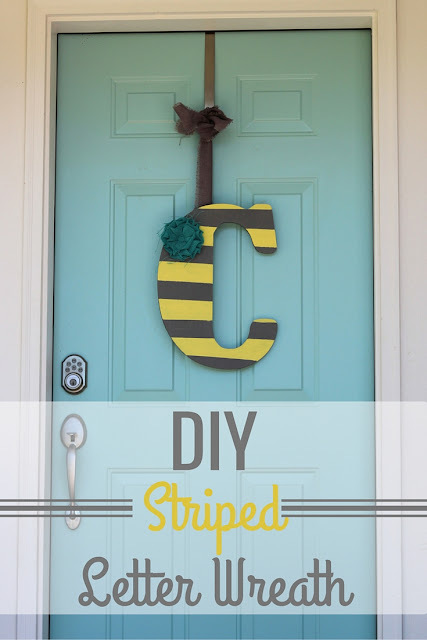 If you want to do stripes, measure and tape off the stripes! Paint the other color to add stripes. Pull tape off right away before it dries. Hot glue on your decor and hang! I tried to do it in an upside down V shape but it was too lop sided so my husband screwed the burlap into the back and we just hung it straight down. Something like an M would work perfectly to do the other way!